Gaining clarity with natural timing and rhythm! Ann was having trouble at school because of her dyslexia. Although she was 14, her tests indicated she was reading at an elementary level. However, with a little hard work and IM training, Ann has brought her scores up by almost two years in accuracy and fluency, and a whopping seven years in comprehension. And it didn’t end there; halfway through IM training, Ann reported that she was also doing better at lacrosse and was even put in charge of practice drills! Timing in the brain, or Neurotiming, is critical to reading, speech, language and cognitive function. Timing is a domain-general mechanism that basis for attention, working memory and processing speed, all of which are critical for reading and language development. While domain-general might sound foreign, it is actually a principle at play right now in your brain. Much of our lives revolve around timing. Reading relies on timing. Sleep cycles rely on brain timing. Speaking is all about pauses and timing; even baking cookies is a matter of timing. This timing in the brain has been shown to be deficient in several common conditions, including dyslexia. 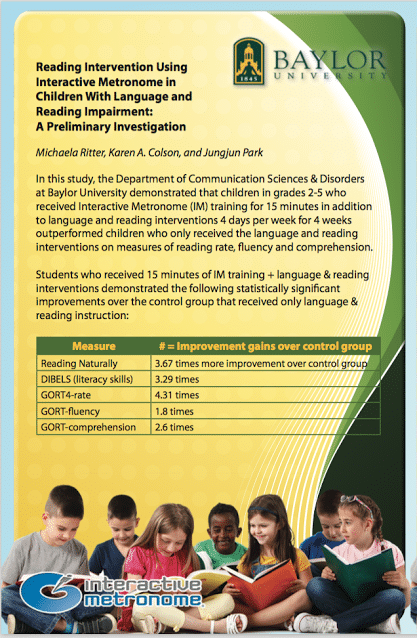 in reading rate, fluency and comprehension over students who just received language and reading instruction. IM-Home makes it easy to train your brain before you start your homework or head off to school, helping to ensure your child retains more from his lessons. No more worrying about fitting training into your schedule. With IM-Home, your child is able to complete their training under the supervision of your therapist, but in the comfort of your own living room, bedroom, office, etc. Ask your Provider about IM-Home today! IM is a research-based training program that has been shown to improve deficits seen in those diagnosed with Dyslexia. For help with Dyslexia and many related conditions, look for Providers with our “Reading/Literacy” badge on our Provider Locator Board. Also, Providers with these badges have additional training for children from similar backgrounds and symptoms: Academic, Early Intervention, Innovative Pediatrics, SPD/ADHD and Speech/Language.